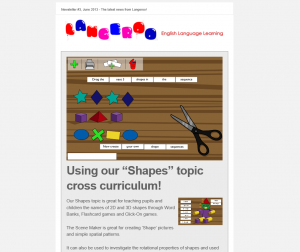 Our Langeroo Newsletters contain teaching ideas for using Langeroo with your children/pupils at home and in school. They also feature special offers, news about forthcoming apps, and information about any updates to Langeroo. Langeroo Special Offers - Save up to 50% on English Language games and activities! Subscribe to our mailing list to receive the latest news from Langeroo, app preview, teaching suggestions and special offers.